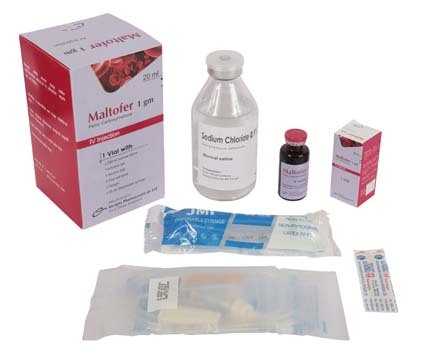 Maltofer 100: Each 2 ml solution contains Ferric carboxymaltose INN equivalent to elemental Iron 100 mg.
Maltofer 500: Each 10 ml solution contains Ferric carboxymaltose INN equivalent to elemental Iron 500 mg .
Maltofer 1 gm: Each 20 ml solution contains Ferric carboxymaltose INN equivalent to elemental Iron 1gm . • who have non-dialysis dependent chronic kidney disease. Note: A cumulative iron dose of 500 mg should not be exceeded for patients with a body weight <35 kg. should be checked prior to repeat dosing. mg of iron more than once a week. mg of iron (up to a maximum of 20 mg/kg body weight). For dilution plan of Maltofer for intravenous infusion, please see attached pdf file. bronchospasm, flatulence, angioedema, pallor face oedema, Rigors, malaise and influenza like illness. pruritus, rash, urticaria, wheezing, or hypotension may occur. serum iron and transferrin bound iron by also measuring the iron in Ferric carboxymaltose. recommended that treatment should be confined to the second and third trimester. Ferric carboxymaltose is excreted in human milk which unlikely to affect the baby.